June is Pride Month, and millions of people across the globe are coming together to celebrate their differences and support the LGBTQ community in their empowering battle for equality. The reason why June became the official month of the Pride dates back to June 28th, 1969, when one of the most important events marked the beginning of the gay liberation movement: the Stonewall riots. 51 years later, this month has become a wonderful time to honor the history of queer people, show support, and recognize the oppression that the LGBTQ community still faces around the world. 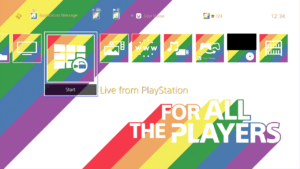 To honor Pride Month this year, Sony released a free PS4 theme called “For All the Players”. It gives a completely new look to the on-screen display of your PS4 console, changing the background, colors and icons to match your favourite game or style. 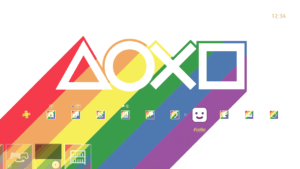 The theme is available for download on the PlayStation Store, and it paints the background of your home screen in all hues of the rainbow so you can show support even when playing video games. Highlighting LGBTQ creators – during each day of June, Twitch will be promoting a different LGBTQ creator on the front page of their platform. Shirts for Everyone – to celebrate this years´ Pride Month, the live streaming company prepared wonderful T-shirts called “Cheer for Equality”, designed not only around the rainbow flag, but also around the bisexual, transgender, and lesbian flags. 100% of the profits will go to the Human Rights Campaign, so go and get yourself one! 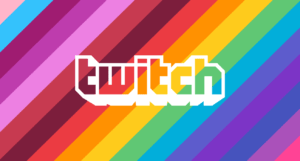 Twitch will not only join the Pride Parade in San Francisco, but they have also partnered with It Gets Better to empower their staff and encourage them to show support! The company is adding stunning Pride-themed emojis, and the best part is that they are here to stay even after June! Fundraising for the Human Rights Campaign – click here to give your support and help them raise money! 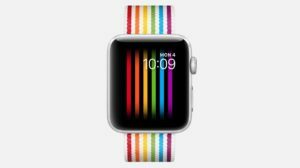 To celebrate the LGBTQ community, Apple released a special Pride Edition band so that customers can personalize their Apple watches. Online orders started in the first week of June, and the company has selected 13 retail stores around the world for display. A percentage of the sales will go to LGBTQ charities. The streaming service company Spotify is transforming its volume bar into a beautiful rainbow to celebrate the LGBTQ month. The colorful feature will be available for the entire month of June in Pride Hub, a special section of the app where you will also find a collection of Pride Month playlists. The colorful changes come with amazing celebratory messages, including LOUD AND PROUD and LIVE AT FULL VOLUME. The world’s largest telecommunication company AT&T announced a $1 million donation and a multi-year commitment to The Trevor Project, a non-profit organization that focuses on crisis intervention and suicide prevention for the LGBTQ youth. The funds will go to the modernization and the transformation of the company’s suicide capabilities so they can serve up to four times more LGBT youth than previously possible. Do not forget to support these initiatives, and let us know how you are preparing for the Pride Month!